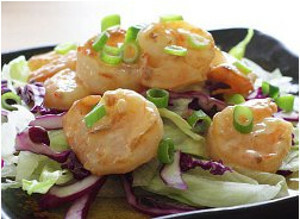 After a long day of work it can be hard to come up with an easy, healthy dinner recipe for you and your family to enjoy. You are absolutely exhausted, and cooking up a storm in the kitchen is the last thing you want to do. 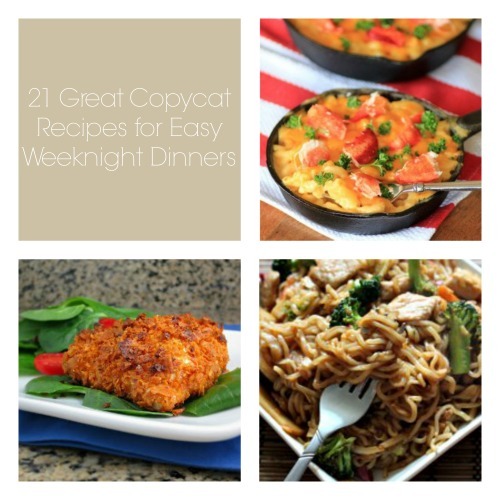 With this 21 Great Copycat Recipes for Easy Weeknight Dinners collection you will never have to scour the web looking for quick dinners for your family again. This group of recipes has tons of easy weeknight dinners like chicken entrees, pasta dishes, and other easy dinners like Bang Bang Shrimp. 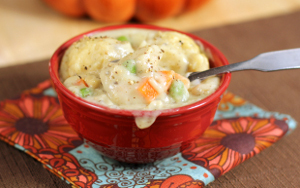 There is sure to be a quick dinner recipe in here that every member of your family will enjoy. Just because you need a quick and easy dinner recipe does not mean that it has to be lacking in flavor or substance. These easy weeknight dinner recipes are copycats of your favorite dishes from popular restaurants like Olive Garden, Pizza Hut, Noodles and Company, and TGI Friday's. 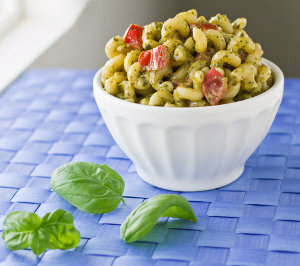 From Italian food to Chinese food, there is a quick dinner recipe here for you. Cooking for a smaller group? Check out 14 Easy Dinner Recipes for Two: Copycat Style for great weeknight meals. Pasta dishes are some of the easiest weeknight dinners because they require little time, and can feed a large group with little effort. However, eating the same jarred pasta sauce time and time again can get a little old. Switch your normal pasta night up a bit with these tasty and easy dinner recipes. Chicken is a great go-to weeknight dinner recipe because it is inexpensive, easy to cook, and can be made into a multitude of different meals. Whether you want a spicy chicken recipe, a simple chicken recipe, or a nice Italian-style chicken recipe, there is something here for you. Do you know what else is an easy weeknight dinner? Pizza. Check out these 11 Delicious Recipes For Your Next Pizza Party for more quick, easy meals. Of course there are many more quick and easy dinner recipes that fall outside of the pasta and chicken realms. These easy weeknight dinners include bold Bang Bang Shrimp, tasty fried rice, and even ramen. Try any of these easy, healthy dinner recipes for a dinner that is sure to please you and your family.